These two best buds first met while reading lines on the set of the hilarious t.v. 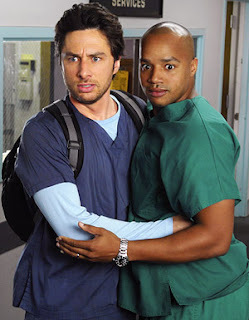 hit show, Scrubs. They meshed immediately and became so tight that after working only one year together on the show, they became roomies while living in New York. Zach makes it a point to note that their ethnic backgrounds in no way defers their friendship. “He’s black and I’m white, and not only is it not an issue, but, well, on the rare occasion it is an issue, we just talk about it and joke about it. Neither one of us is uptight about the East Coast Jewish stereotypes or the black stereotypes. We are from totally different backgrounds and have the same sense of humor.” says Braff as he tells Hillel.org. Faison goes to say that they are so much like their characters that they might as well be the real life J.D. and Turk. For more info on Scrubs, be sure to visit: Scrubs TV.